Ridiculous Infomercial Review reader (and Klee Irwin fanatic) Dan let us know about a very cool resource on the Web called the Simpsonizer. 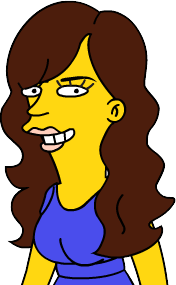 This Website, which is part of Burger King’s promotion for the Simpsons movie, lets you submit a photo and get a “Simpsonized” result, so that you would know how the person would look if they were ever on The Simpsons. You can just image Klee Irwin arriving in Springfield, promising to get rid of Homer’s gut if he’d just get his colon cleansed. As you can see the Simpsonizer is a very cool tool! I’ll be trying to create pictures of more of your favorite infomercial stars soon. Great job on the photoshop!!!! It looks great! 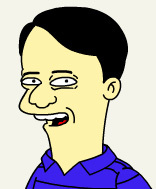 Sorry I forgot to give you the link to the simpsonizing website, but it looks like you found it just fine. Hey I wonder what Kevin Trudeu wouold look like? Dude, Klee Irwin actually looks like a real live Simpsons character. He needs no help at all. I’ve been saying this ever since I first had the extremely wonderful luck to witness my first Dual Action Cleanse talkshow. I mean, look at him! 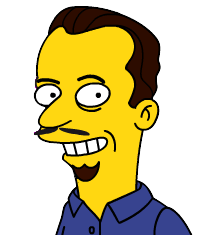 The impossibly long head, the overbite, and in his earlier “talk show appearances” he had that grey pallor some of the earlier Simpsons characters had.